Montblanc introduces its annual Patron of Art Edition 2013 commemorating the life and influence of Ludovico Sforza, Duke of Milan, one of the most prominent patrons of the Italian Renaissance and protector of the great Leonardo Da Vinci and other outstanding artists. For 22 years, the Patron of Arts Edition has celebrated the contribution of a different historical patron of the arts and coincides with the annual Montblanc de la Culture Arts Patronage Awards, an honour established in 1992 to recognize the commitment of modern day patrons of the arts in 12 countries. For 15 years, starting in the 1490s, Da Vinci worked for Sforza, during which time he created two of his best-known works for his patron: *The Last Supper* in the convent church of Santa Maria delle Grazie and *The Lady with an Ermine*. Sforza*s legendary black armour is symbolized on the Limited Edition by the gleaming black lacquer with .925 sterling silver inlays. 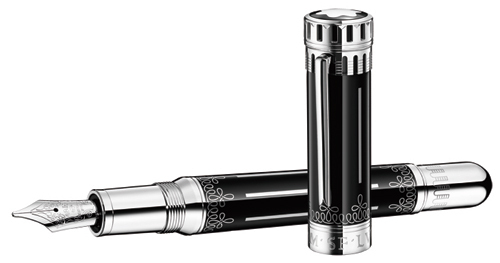 The cap and clip design of this Limited Edition 4810 are inspired by the striking cylindrical towers of the Castello Sforzesco (the expansion of which was commissioned by Sforza), and the pen*s fittings replicate Leonardo da Vinci*s ceiling fresco from the *Sala delle Asse* in the Milanese castle.To honour this clever diplomat and intriguer, who was overthrown by the French King Louis XII after forming an alliance against France in 1499, the *testone*, a coin of the Italian Renaissance, was minted. Its distinctive embossments are immortalized on the cap ring. The .750 rhodium plated solid gold nib of the edition is engraved with the Duke*s coat of arms, a final acknowledgement to a lasting cultural legacy. The .925 sterling silver, piston filled fountain pen is crowned with the Montblanc star in white precious resin.